An optical time-domain reflectometer (OTDR) is an optoelectronic instrument used to characterize an optical fiber. An OTDR injects a series of optical pulses into the fiber under test. It also extracts, from the same end of the fiber, light that is scattered (Rayleigh backscatter) or reflected back from points along the fiber. (This is equivalent to the way that an electronic time-domain reflectometer measures reflections caused by changes in the impedance of the cable under test.) The strength of the return pulses is measured and integrated as a function of time, and is plotted as a function of fiber length. An OTDR may be used for estimating the fiber length and overall attenuation, including splice and mated-connector losses. 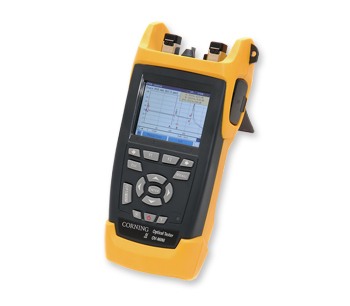 It may also be used to locate faults, such as breaks, and to measure optical return loss. To measure the attenuation of multiple fibers, it is advisable to test from each end and then average the results, however this considerable extra work is contrary to the common claim that testing can be performed from only one end of the fiber.